I am wanting to make a centerpiece with molded lollipops, much like the one you have pictures. What supplies (other than the lollipops) did you use? Specifically what kind of container and what did you use to hold the lollipops in place? There are a few different ways you could make a centerpiece with molded lollipops. 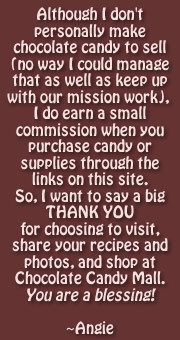 There are some tips and instructions on this page about chocolate candy bouquets. Choosing the right container will depend on how large you want your centerpiece to be and how many lollipops you intend to use. You could choose something as small as a mug or as large as a shoebox, bowl, or large basket. I use florist or crafters foam for the center to hold the lollipops. It works well because you just poke the sucker sticks in exactly where you want them to make an arrangement, just like you would with flowers. You can hide the foam with shredded confetti, tissue paper, ribbon, etc.